Reader Question: Which surface do you recommend when using colored pencils along with acrylics? It needs to have the right tooth to accept colored pencils. It needs to be sturdy enough to accept acrylics without warping. I've provided links below to the relevant products so that you can easily find them on Blick Art Materials, my favorite online art supplier. I'm a member of Blick's affiliate program, which means if you make a purchase after clicking on one of these links, I'll receive a small commission (at no extra cost to you). Your purchase helps support this site and keeps it free of ads. Click here for more info. 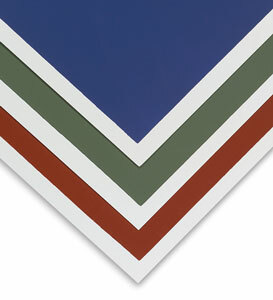 Art Spectrum Colourfix Multi-Media Painting Board is a strong archival board available in a range of colors. 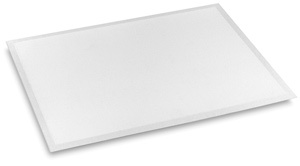 Art Spectrum Colourfix Supertooth Board is even heavier than the above-mentioned Art Spectrum Colourfix Multi-Media Painting Board, and is available in white. 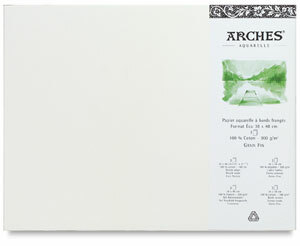 Watercolor paper or printmaking paper such as 300lb Arches Watercolor Paper can handle both colored pencils and acrylics. I'd recommend getting the heaviest paper available, which is usually 300lb. Depending on how much acrylics you use, you might be able to use the lighter 140lb paper just fine, but in general when using acrylics on paper I prefer to use the heaviest paper possible, just to be sure the paper won't buckle or warp. Choose "hot press" if you want a smooth surface, otherwise the bumps in cold press watercolor paper or rough grain watercolor paper will cause "bumpiness" when you draw on it. In terms of painting on watercolor paper or printmaking paper with acrylics, keep in mind that this type of paper is best suited to flat styles, rather than realistic styles that require lots of blending. This is because the paper will quickly soak up the paint, making it difficult to create smooth blends. 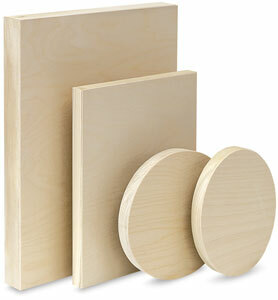 Wood is an interesting surface that can accept both acrylics and colored pencils. You can either draw directly onto the wood with your colored pencils, or you can prepare it with a light coat of Golden Pastel Ground. (See below for more info about Golden Pastel Ground.) Another option is to lightly sand the wood to give it more tooth. Ampersand Claybord is a clay-coated multimedia panel that readily accepts both colored pencils and acrylics. 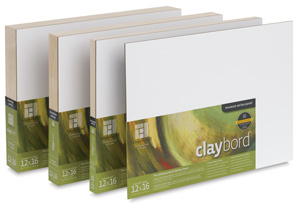 Claybord is available as a 1/8" thick board, or with a 3/4" or 2" cradle that allows the artwork to be hung directly onto a wall without a frame. 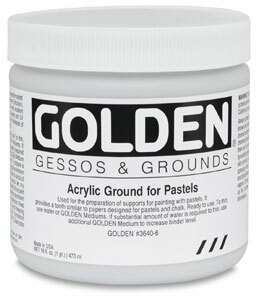 Apply Golden Pastel Ground to canvas to create a toothy surface that can readily accept colored pencils. If you want to draw on canvas, this will allow you to do that. Because Golden Pastel Ground is meant for use with pastels, you might want to apply a thin, light coat so that the surface isn't too toothy or gritty (which will eat through your colored pencils quickly). So you can see that you have a lot of options if you want to create a mixed media artwork with colored pencils and acrylics! Hope that helps and Happy Art-Making! By Thaneeya McArdle © 2008-2019 Thaneeya LLC.